In honor of the National Stock Show here in Denver, I’m paying homage to my favorite fare: BEEF! Sixty-two percent of Americans profess their love for steak as their most desired Valentine’s Day meal (according to a recent survey conducted by Pelegrin Gray for The Beef Checkoff Program). Nothing says love like beef and backrubs: Forty-three percent of Americans said they would choose a steak meal to kick off a romantic evening of hot tub time, back rubs and champagne. They call me Dr. Love: Americans associate steak as a “best match” for love (44%), romance (42%) and passion (41%)—more so than chicken, pork or fish. 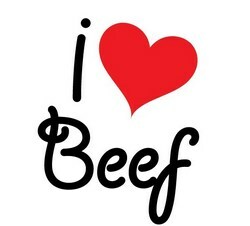 Let’s meat: Beef (36%) is more often associated with “magnetism” than fish (22%), pork (21%) or chicken (21%). 50 percent of Americans associate beef with celebrations, compared to chicken (18%), pork (17%) or fish (15%). An Impressive Selection: Sixty-two percent serve a beef dish if they are hoping for their partner to express gratitude or appreciation for their efforts. The Perfect Pick: When choosing a meal for a significant other, 61 percent say they would order beef at a restaurant to express how much they care. Sign me up to get Gourmet Glee emails!